The skin is naturally acidic. Surprised? When we think of acidic, we probably think of lemons, grapefruit, and vinegar. Skin exists at a pH of around 5.0 (which is slightly acidic). This is an average, but it can range from 4.0 – 6.5 depending on your skin chemistry and what products ie. Medications, environment, nutrition and skincare you have been using on your skin. This acidity plays a key role in skin. Certain enzymes in the top layer of your skin are activated at an acidic pH. Changes in pH affect enzyme activity and interfere with the skin's normal shedding process (desquamation), which is why maintaining the correct pH of your skin is always essential for healthy skin. Additionally, a lower acidic pH of 3.0-4.0 inhibits the growth of certain harmful bacteria on the skin. Anyone involved in skin care needs a thorough knowledge of pH. On its surface, the skin has an acid mantle, which is made of lipids, sebum, and sweat. 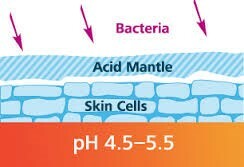 The acid mantle (Skin) has a pH of about 5.0, which is a slightly acidic pH. Because Ossetra® uses natural ingredients the skin's cell receptors recognize them and the skin is able to benefit. Skincare should also have a slightly acidic pH. Higher pH values tend to swell the skin and makes it more porous. The only time an alkaline based skincare product is used is for desincrustation solution (baking soda) which is used to treat clogged pores and oily areas to slightly dilate the pores for easier extraction. They also help to conduct electricity (galvanic current) better for desincrustation. Ossetra® Iceberg Skincare maintains a pH of between 4.5 to 5.5 depending on the product and job it is intended to do. Ossetra's Skincare regime consists of Cleanse, tone & moisturize. Ossetra's Gentle Cleanser, for example, has a pH of around 5.5 which help to efficiently take away sebaceous secretion of oily or problem skin. Most high pH products of 6.5 to 7.0 can be harmful to the skin particularly if they are not controlled. High pH products increase the skin pores and make the skin more permeable (porous) therefore, making the skin easier to accept bacteria, microorganisms, and other harmful substances into the body. Harsh, high pH products can be very irritating and can severely dry the skin. Ossetra's Sea-Water Bodi Mist Toner, pH 5.0 helps to balance the skin while closing the skin pores and the Antioxidant Day Creme, pH 5.0 rehydrates and moisturizes while incorporating high antioxidants. The other exception to the lower acidic pH guideline is products that contain high peptide protein such as caplin-caviar, sea-cucumber-shell, whelk shell-shell foot and mushroom-chaga are not stabilized at their acidic pH levels. Products containing these ingredients, such as peptide protein (collagen) may need to be at a more neutral pH for stability purposes. Ossetra® was able to normalize the pH of these ingredients by introducing Iceberg water which has a natural pH of 5.0 therefore, balancing the skin's pH and thoroughly hydrating the skin's acid mantle while incorporating these acidic proteins into the skin pores safely. Being aware of pH values is especially important in natural exfoliation and peeling procedures (lemon juice, grape juice, vinegar). 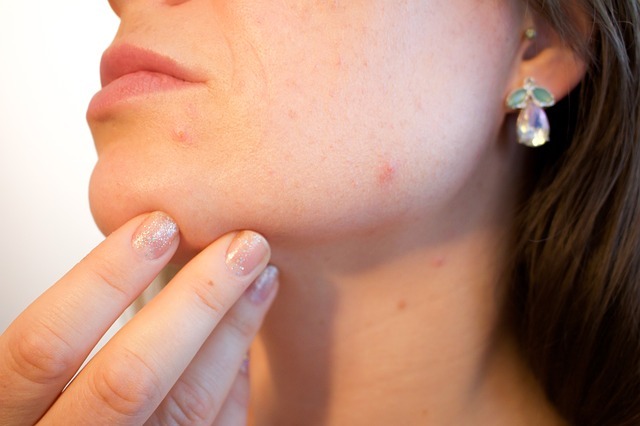 Individuals should always use these treatments under the care of a professional Aesthetician as a lower or higher pH can increase skin irritation dramatically. Newer PostStay Green – Go Blue! !